They say imitation is the highest form of flattery, but Honey, it's time to get your own ideas! WooshBuild Infinity, The Enigma2 Image for you. In true WooshBuild style, WooshBuild Infinity is the first enigma2 image-less build and the best WooshBuild yet to be released for ALL Enigma2 set top boxes. With the ability to be installed on any enigma2 box with a simple command, there is no need to wait until a dedicated image is created for your box or any download.. WooshBuild Infinity will work on your box now. WooshBuild Infinity is the only Enigma2 image to have a full menu driven setup on your TV screen. No need for any extra setup steps once your box has restarted as everything is done on your TV screen with your remote. 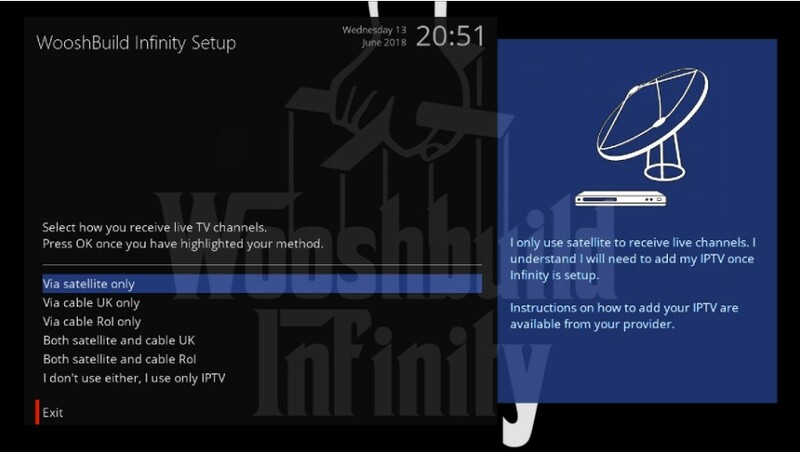 Infinity will now configure FreeView channels with nothing more than a postcode. Just like a Smart TV! Works with FreeSat, FreeView, Saorview and the free cable channels with simple on screen menu driven setup. Brings back old boxes from gathering dust. 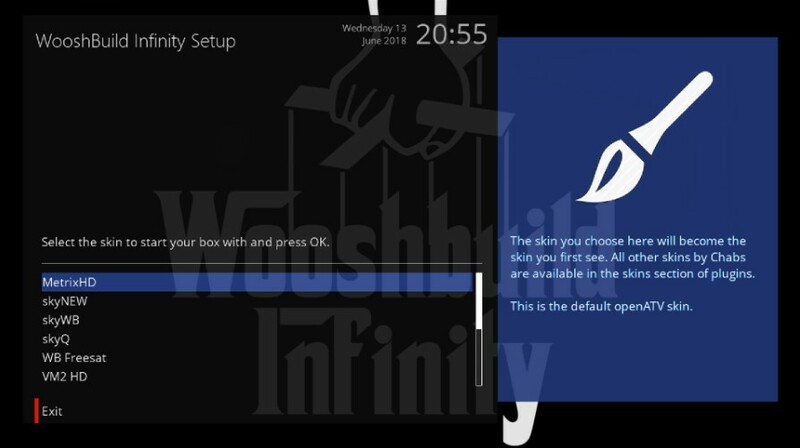 If there is an openATV version for your box, WooshBuild Infinity will run on it. We do it all during setup so you don't have too. The openATV setup wizard seamlessly goes into the Infinity setup screens so everything flows. Click on the images for a closer look and description. When your box restarts everything is done. No manual steps are required. 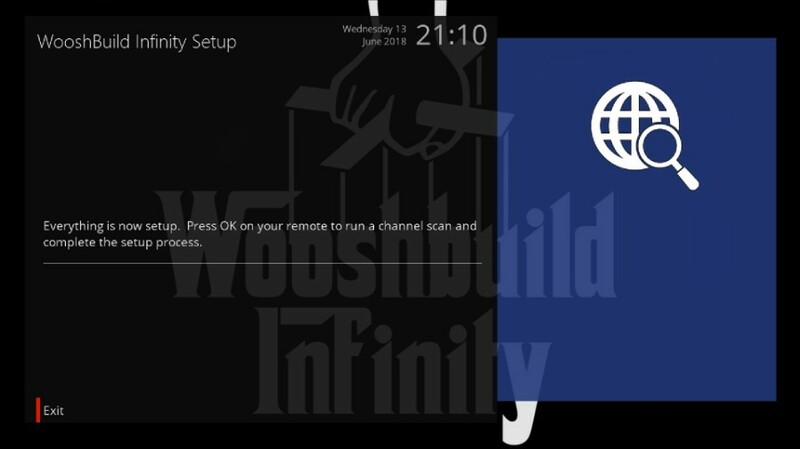 Using openATV, WooshBuild Infinity can run on openATV 5.1, 5.3, 6.0, 6.1 and 6.2 onwards. This means you can get the most out of an ageing box by using an older lightweight version of openATV or use the latest beta releases if you want to see what they have added and always be up to date. We will be looking at it also running on ViX in the future. It is planned that it will still use the same simple command for both versions. Infinity runs on all Enigma2 boxes. 1. Flash your box with the version of openATV you want to use. 3. Open the terminal window & login as root. Use the Techkings link above to get the terminal code to use. 5. Initialise your USB / HDD if required, select method of viewing live channels, select your default skin, automatically scan channels, setup your screen position for best results and restart your box. 6. Use your box safe in the knowledge that WooshBuild Infinity has done the hard work and all of the expected plugins and settings have all been taken care of for you. 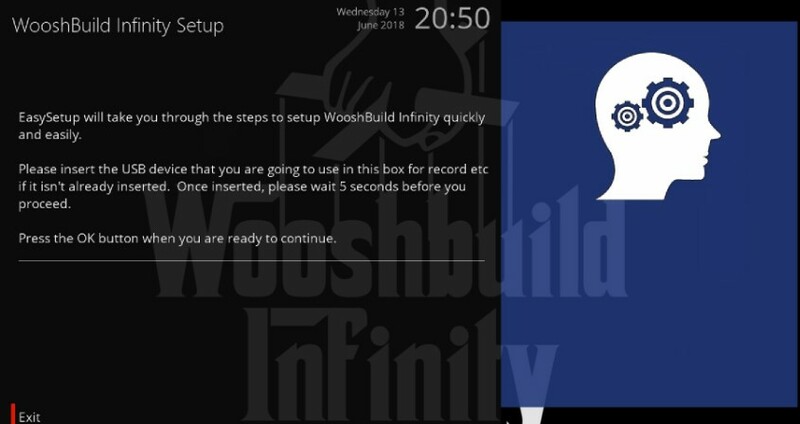 WooshBuild Infinity takes no time at all to install on your box and there is no manual configuration required. 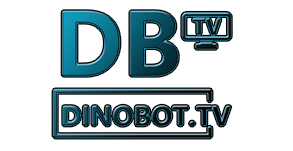 WooshBuild has always been about ease of use for new and existing users, saving at least an hour of your time flashing your box with a base image of openATV and then installing plugins, skins, setting up various settings and scanning for channels. WooshBuild & Infinity does all of this for you. WooshBuild first started life as a very basic backup image from an H2S as there was no up to date openATV image available for users. A skin, a channel scanner and a lot of instructions to set it up was the only thing available. With thought I was able to introduce new ways of making things easier by including more settings being pre-confgured. With every new release of WooshBuild were new images for more boxes and still people would ask if WooshBuild was available for their make / model of box. With over 15, maybe 20 boxes in the cupboard, making new images was time consuming and sometimes confusing trying to keep on top of each image. This is when we knew it was time to put an end to one image for one box by making WooshBuild Infinity availble for every enigma2 box. Should the question "is WooshBuild available for my box" be asked again, the answer is now yes. A lot of planning, time and effort has gone in to making Infinity work for everyone regardless of the box make or model. It has been tested on boxes we have never even heard of with exactly the same results as the leading box names such as Vu+ and Zgemma, each time a success. WooshBuild has always been populer will resellers of Enigma2 boxes. Now with Infinity you only need to flash the box and run the Infinity setup command to start the setup process, you can then turn the box off and ship to the customer. The first thing your customer will see is the setup wizard. No need to guide them though how to setup their region, transmitter or even netID as all this is done on their TV screen in simple easy steps. Just some simple 1, 2, 3 instructions will do to get them going. 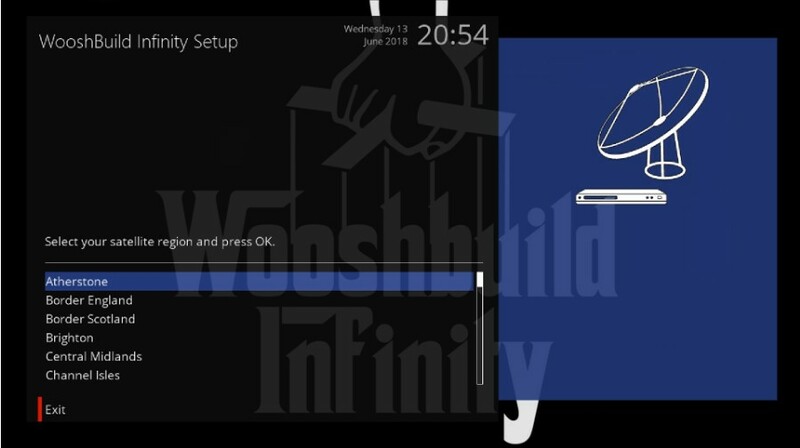 WooshBuild Infinity is the only Enigma2 build to do the full setup procedure in a simple to use menu driven system. No other image can setup your box without the need to manually configure settings after the box has restarted. Did we mention it also works on every Enigma2 box?